What does an Art-Farmer do? Art-Farmers are everywhere…..perhaps, very soon even on the White House lawn. come to our real journey. For the past five years in the winter months, I’ve spent a lot of time drawing and writing, and doing a little painting and making big papier maiche puppets and masks. Along with a few more tasks in planning the Art-Farm workshops, during my spring, summer and fall garden hours, I spend a lot of time making friends with the soil in our Community Gardens and hauling water from the creek to water the plants in the Art-Farm teaching and market gardens. In between all of this, I hang out with amazing kids, I’ve become a full-time bike-rider, been studying permaculture, and, of course, I bake pies. This week is a BIG week for me with the culmination of many hours of meetings, and many months and even years of planning all of the above and including a whole lot more. On Tuesday, what began as my creation and is now shared by many, our Art-Farm brainchild, Little Artshram, presents a final request to acquire and hold a lease with the City of Traverse City and Rec Authority on a 54-acre piece of land that includes the old State Hospital Farm and our beloved Community Gardens and Art-Farm Workshop space. Little Artshram has worked with and towards carrying on the vision of Rolling Centuries Farms for this property to become a working educational farm. Our partner organizations are SEEDS and the North West Michigan Botanic Garden Society, as well as Spireworks. We have worked to craft a governance agreement under the guidance of Northsky Nonprofit Network. I’ve been able to share and survive hundreds of hours of planning and organizational meetings for the barns property, with the help and understanding of the Little a board and advisory circle, and also, by drawing and cartooning business and program plans and ideas. In an effort to stay true to my Art-Farm vision, I’ve attempted to share some of these illustrated plans and ideas. At times, it hasn’t gone over real well. And I’m not the best at explaining myself. I wonder about my abilities and language and the true desire to understand and be understood. I’m humbled to realize that no matter how old I am, how many years of experience or head-banging realities I’ve encountered, or, what my resume lists as accomplishments, there always seems to be another deeper layer underneath and further to go. So what’s next after this lease agreement is offered to Little Artshram and our Art-Farm has a real, homeplace? Without any righteous attitude, I feel like I’ve done a fine job of creatively tossing puzzle pieces into the sky and gather them back into a whole, lovely, picture originally called ARTSPACE and now called Little Artshram. As I shared last spring, I’m side-stepping my solo role as directress of Little Artshram, remaining on the board, and perhaps teaching, to become a full-time O’k Art-Farmer. And I’m not sure who will be heading up the Little a bandwagon, or what my O’k Art Farming will bring except I’m going to keep practicing and studying permaculture, growing my own food, and, writing, drawing and cartooning for quite awhile longer. 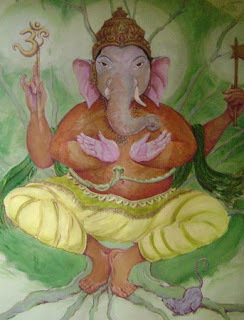 Since I brought up Ganesh, the remover of obstacles when last month, we intelligently voted in a new presidential leader and his family….I’ve decided to add an image of Ganesha from a mural painting I made for my friends Libby and Michael which hangs at their Yoga for Health Ed studio in Bldg. #50…..This work is a 5′ by 6′, acrylic painting of the elephant boy-god resting at the base of a maple tree. 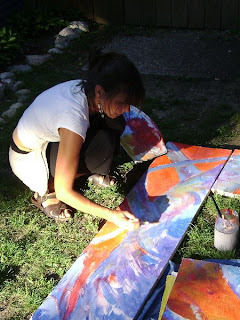 I painted the background green in hopes of chasing off the long winter, cabin-fever blues I was experiencing while working in my art-farm studio in early 2005.